This Enigma is a lightweight self-propel wheelchair that is well constructed and ideal for those who want a good model that won't break the bank. It's reliable enough to meet the demands of most occasional users, and the lightweight aluminium frame means that the chair comes in around 8kg with the wheels removed. The light weight doesn't detract from user comfort. The arms are padded and the seat and back intended to provide plenty of support. 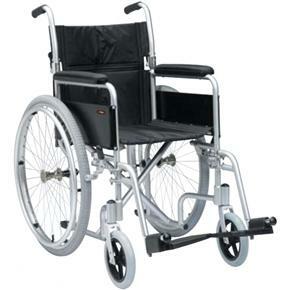 The leg rests on these Enigma wheelchairs are adjustable for users of different heights. Aluminium frame with metallic silver finish. Ideal for users who want the flexibility and convenience of a lightweight wheelchair. Very happy with this chair, Its nice and lightweight, folds easily and is easy to push myself in.